Previous Post Happy Mother’s Day from all of us at Heavers Games Club. i dont know…actualy i’d miss all the colors. 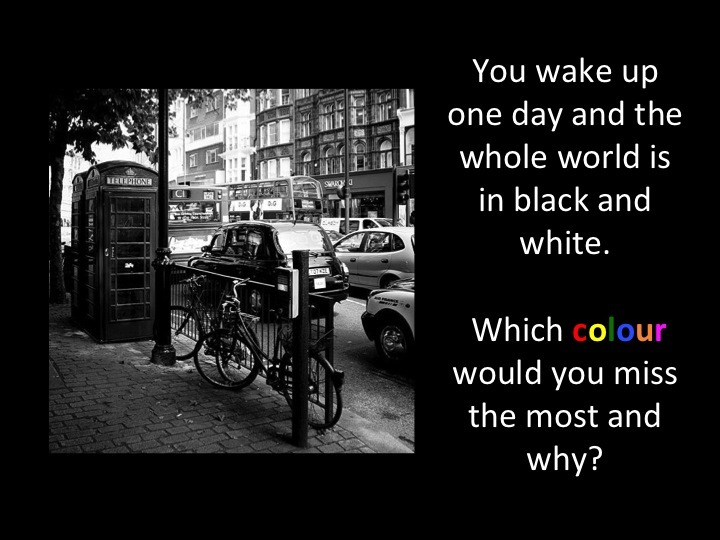 because i would say a world without colors is a world without love. This is the sign of light, God and happiness and everyone needs a bit of happiness in their lives! This is the sign of light. I would miss all the colors because I like all the colors. Also I don’t really mind at all. I would miss the colour’s of the sky because they are the best colour’s. I would miss yellow because without it, the sun wouldn’t be able to light up the world. I think black and white is a way of thinking it could be positive and negative. I would like to say black and white is the way of thinking which could be positive or negative. I’d miss the colour of nature because it’s beautiful and it’s not the same without it..
Well I would miss light blue because that is the day and I would never like to miss day . I know it is just 1 coulor but i would also miss red because it is one of my fave coulors. Every colour because when we watch TV we watch it with colour and if there was no colour on TV we wouldn’t get what there talking about or see the characters properly. Also I wouldn’t be able to watch amazing world of gumball and that has loads of colour characters on it. So it will be 1950’s all over again. I’d miss blue, pink and purple because they make a beautiful color in the sky. So PRETTY! I agreed its a nature principle that without a colour there is no life. I would miss pink because it’s my favourite colour and matches with most of the colours. you see every day and time. The colour I would miss the most is Blue because it’s the colour of the sea,sky and our uniform also it’s my favorite colour. The colour I would miss the most is blue it’s favorite colour and it’s the colour of the also the sky. I would miss all kinds of blue. 1.navy blue:it’s the colour of our school uniform and without it we are all nothing! 2.baby blue:it’s the colour of the sea and water. Without water we would be really thirsty and the sea i wouldn’t be able to go to jamacia and go to the beach 3.turquoise (light green and light blue mixed) if it was gone then my world would come to an end! I wouldn’t miss my favourite colour pink because my blood will always be red.Red and white makes pink. I would miss rainbow colors.Obviously everyone would miss all of the colours but actually to know the answer we should justify the living in an uncolourful world. I am not sure but I think that i will miss all the bright colours, the brigthen up the world without bright colours some people will be miserable and dull seeing dark colours all the time.But especially red; it repesents the colour of love ; you need love in the world. The world will be boring because if u want to go shopping it will only be white or black.